My goal is to be working as a software developer before the year 2016. My website will help me achieve this goal by showing local tech folk my knowledge, skills and achievements. All updates to this project can be found on the main project page. The initial survey I created to better understand my audience was 52 questions long. I asked a few local UX professionals about it and they pointed out that it was entirely too long. I used these questions in a 40 minute interview with a technical recruiter who was nice enough to give me some of her time even though the interview was too long. I also had the realization that as one person working on the design and development of my website, 52 points of information is probably way too much for me to handle. An in depth guide is great for a team of designers who are creating requirements for a team of developers, but as one person doing it all I needed to scale it down a bit. I realized that, for this project, my audience’s gender and personality type are not as important to me. What I really care about is how they use my website and what they want from it, so I decided to redesign my survey. My redesigned survey can be found here. I sent the new survey out to those within my network that I consider to be recruiters and curious developers which gave me more responses. My personas are based off of the super helpful DIY User Personas post by UX-Lady. They are also hand drawn because pens and markers are easier for me to use than publishing software. This process has pointed out to me that I am not the designer-type. This is the end of this process for now. It’s been eye-opening to dig into the Discovery stop of the UX Design process. If you’re more design oriented than I am then check out the links in my Learning UX Design: Strategy and Learning UX Design: Design posts. 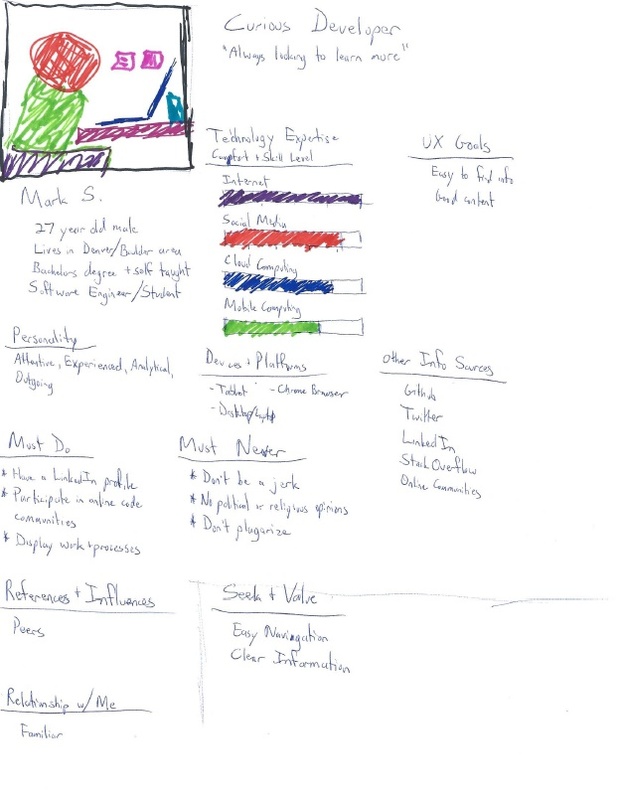 I’m excited to continue my exploration of UX Design, but personas make me nervous. It means I have to talk to people. I’m not the hide-in-a-dark-room-all-alone kind of developer, but I’m not a social butterfly either. I also like to sound like I know what I’m talking about, but since I’m learning about UX I don’t know what I’m talking about yet. It’s much easier to admit ignorance behind a keyboard. It’s much more difficult to admit it when talking to people who I want to consider my peers and bosses someday soon. Part of my purpose for this website is to “show local tech folk my knowledge, skills and abilities.” Who are these tech folk? What information do they want to know? I decided to group my audience into 2 personas: people who make hiring decisions regarding software developers and curious programmers. I don’t think I’ll ever have more than 3 personas unless absolutely needed. I would just get overwhelmed. Finding out more about my audience? Users are the most important people involved in a UX project. Without users, a website/app/program is just an exercise in programming. I want my projects to be useful tools for other people so I need to find out what they want. I’ve found that the best way to find out what people want is to ask them, so I’ve created a survey and interview template. Demographics: Age, gender, location, education, etc. Personality Information: I created questions based on the Myers-Briggs Personality Types as well as the Big 5 Personality Traits to find the personality of my users. References and Influences: References are people and organizations that I am associated with. Influences are people and organizations that my audience knows to evaluate my website. 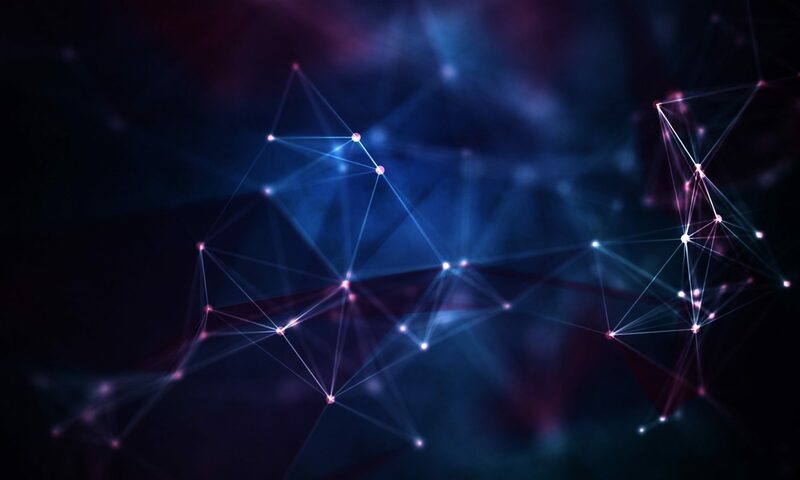 Technology Expertise: In order for me to make a website that works best for my audience, I need to understand their comfort and skill with various technologies such as internet navigation, social media navigation, mobile usage and cloud computing resources. Experience Goals: What is my audience looking for when they come to my website? What are their priorities? What is my audience’s expectations for the website? How do they want to feel when looking at the website? Devices and Platforms: Find out what devices my audience uses to view my site. Find out what operating systems and browsers my audience uses. Domain Details: used apps/websites: Find out what applications and websites my audience uses to evaluate my personality, knowledge and abilities that do not include my website. Must Do/Must Never: Find out up to 3 things that my audience feels that I must always do online and find 3 things my audience feels that I must never do online. Relationship with Brand: In this case, the brand is myself. Find out what functionality that my audience wants from my website. Also find out how familiar my audience is with my personality, skills and abilities. My interview can be found here on SurveyPlanet. Please consider filling out the survey so that I can continue my research. 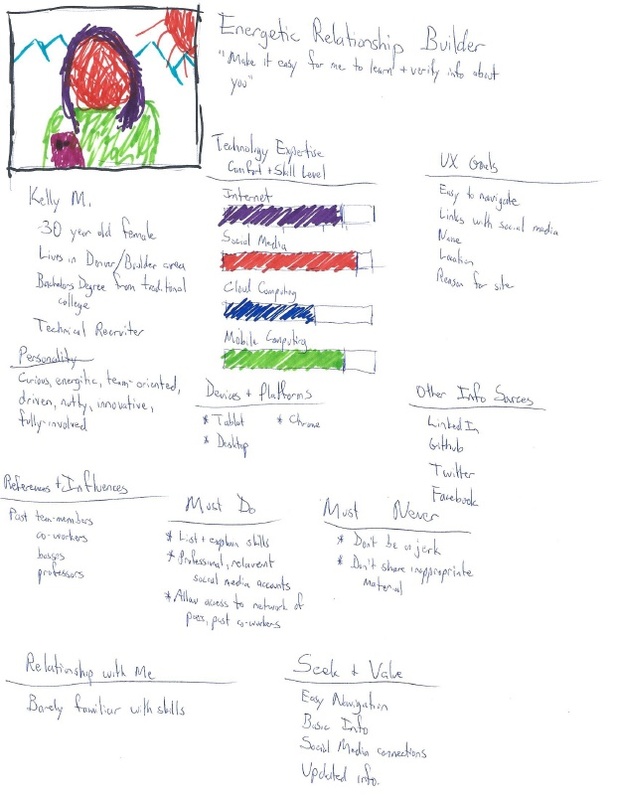 These templates are built on ideas from the DIY User Personas post by UX Lady. What’s in store for part two? In part 2, I review my survey and interview results and complete my personas. Measuring your goals for a website is so easy it’s hard. What do I mean by that? The internet is full of tools to measure and report metrics! You can measure any and every metric possible, but until you know what it is you want to measure, all these tools will only provide useless fluff. I only looked into one analytics tool, Google Analytics. Truthfully, It does about 50 times more than I could ever possibly want to do, but it’s free and I’m already immersed in the Google world. Plus I was impressed with the really cool Google Analytics Academy that I got to use as an online, self-paced guide to learn about analytics. I need to make sure I’m measuring information from my website that relates to my goals. Essentially I narrowed down my main goal into 3 main parts. I want to attract people who are involved in the local technology industry, because those are the people I want to work for and work with. I want to show off my work to the people who visit my site. And since I am not planning to complete my goal for another 2 years, I want to encourage visitors to return and see more projects. At the recommendation of the Google Analytics Academy, I decided to use Avinash Kaushik’s measurement planning model to measure my website’s success. Since my website is essentially a branding website, I decided to go with the goals that closely resemble a branding website such as driving awareness, engagement and loyalty. I will attract users, show off my work and encourage loyalty. I will attract visitors using social media posts. I will measure my success by using the Key Performance Indicators (KPIs) of the amount of visitors and the bounce rate for my landing pages. 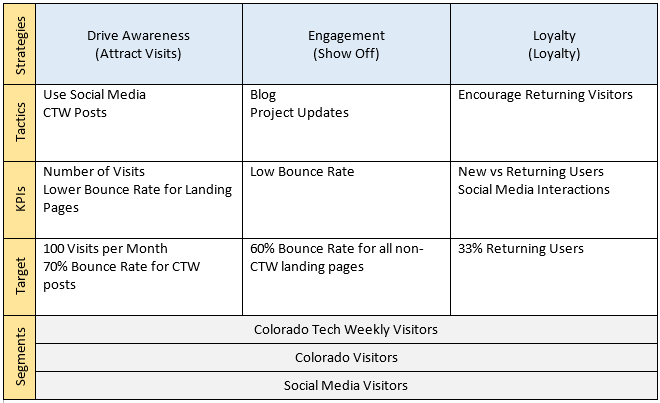 My target goals are 100 visits per month and a maximum bounce rate for my Colorado Tech Weekly (CTW) posts of 70%. I will show off my work with blog posts and project updates. I will measure my success by using bounce rate as a KPI. My target goal for my non-CTW landing pages is 60% bounce rate. If you are interested in my blog posts and project updates, I assume you will be more engaged than the average CTW visitor. I want to encourage returning visitors. I haven’t quite figured out how to do that yet, but I want to measure my success by comparing new vs returning users and by my social media interactions. My target goal is to have 33% of my users to be returning users. This will require some work. Next up, I will focus on personas. It’s time to me to find out who my audience is so that I can adapt my content accordingly. As much as I want to jump into learning code and modifying my website, I need to keep in mind why I want people to visit my website. I want people to read about my professional goals and projects. In order for people to read about these things, there needs to be words (Crazy, I know). So I spent my first week focusing on the content of my site. I also spent some time focusing on my social media profiles such as LinkedIn because I know that if someone is looking to learn about me on this site, they will also probably check out those sites as well. My online presence isn’t just this site. With my basic content laid out it’s time to jump in to learning about UX (user experience) design. Even though my goal is to become a software developer, I think it’s important for me to learn UX because I want to create software that people actually want to use. I could come up with the best way to sort and categorize data, but if no one can figure out how to use it then there’s not much point in creating it. I want to learn UX design because I’ve always wondered how people decide where to put buttons and fields in apps. I am going to spend 3 weeks drilling down on the basics of UX design using UXApprentice.com as a guide. I will also use tutorials from HackDesigns.org, free local seminars such as the “Design Research to Experience Roadmap” I went to on Thursday hosted by Slice of Lime at Galvanize, and a great list of links from helpful, local designer/developer Alex Hoffman (Follow him on Twitter, he’s a nice guy). After those 3 weeks I will attempt to make use of my newfound knowledge and use it to design this site. Next week I’ll focus on the discovery step of the UX design process.